Figure 1. 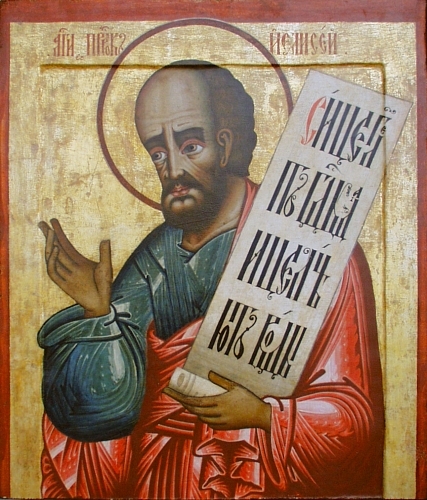 Prophet Elisha, Russian icon from first quarter of 18th century. The prophet is often portrayed with an uncovered, bald head. However, such a depiction may be the result of a textual misunderstanding. came forth… out of the city. Jewish legend says that those who mocked Elisha were people of Jericho whose trade in selling drinking water had been spoiled by the miracle wherein he “healed” the local waters. “[The phrase ‘Go up’ was not a topographical reference] to the uphill grade of the Bethel road. Instead the youths were alluding to Elijah’s translation to heaven. This they did not believe. … To put it in modern terms, they jeered, ‘Blast off! Blast off! You go too. Get out of here. We are tired of both of you.’ These … ruffians used the same Hebrew verb used at the beginning of the second chapter of 2 Kings to describe the taking up of Elijah into heaven.” Note that a parallel to the unsuccessful search for Elijah after he was taken up to heaven is found in the Enoch literature where Enoch and a group of followers are similarly taken up to heaven. Larsen, David J. "Enoch and the City of Zion: Can an entire community ascend to heaven?" BYU Studies 53, no. 1 (2014): 25-37.
 https://en.wikipedia.org/wiki/File:Elisha-Eliseus.jpg (accessed 7 August 2018). NET Bible, NET Bible, 2 Kings 2:25 n.
 L. T. Dennis et al., ESV, 2 Kings 2:23-24, p. 649. See L. Ginzberg, Legends, 4:239-240 and 2 Kings 2:19-22. W. C. Kaiser, Jr. et al., Hard Sayings, p. 232. M. Cogan et al., 2 Kings, p. 38. W. C. Kaiser, Jr. et al., Hard Sayings, p. 233. See D. J. Larsen, Enoch and the City of Zion (2014), p. 28; J. M. Bradshaw et al., God’s Image 2, pp. 163, 193 n. M7-23, 460. Cf. H. W. Nibley, Enoch, pp. 252-253. G. M. Lamsa, Light, p. 360. G. M. Lamsa, Light, pp. 360-361. W. C. Kaiser, Jr. et al., Hard Sayings, p. 233. See Leviticus 26:21-22. E. T. Rasmussen, OT Commentary, p. 301. Clarke, Commentary 2:486 in Old Testament Student Manual, Old Testament Student Manual, 2:64. W. C. Kaiser, Jr. et al., Hard Sayings, pp. 233-234. See 2 Chronicles 36:16.